This September state jobs data, released today by the Bureau of Labor Statistics, show state labor markets largely unchanged from August conditions. 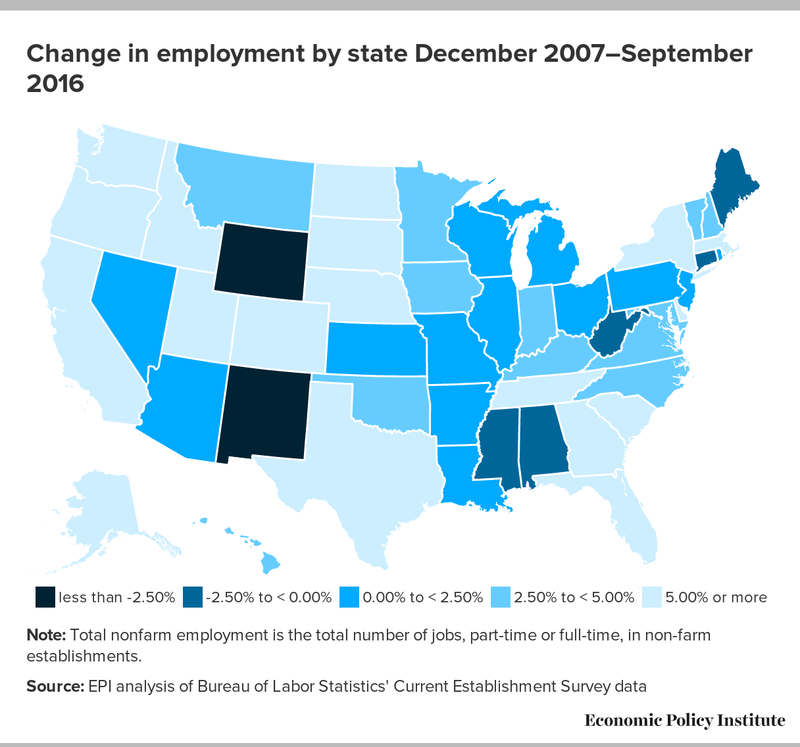 Most states continue to add jobs, although a number of states—primarily those heavily dependent on the energy sector—are still showing losses over the past several months and past year. 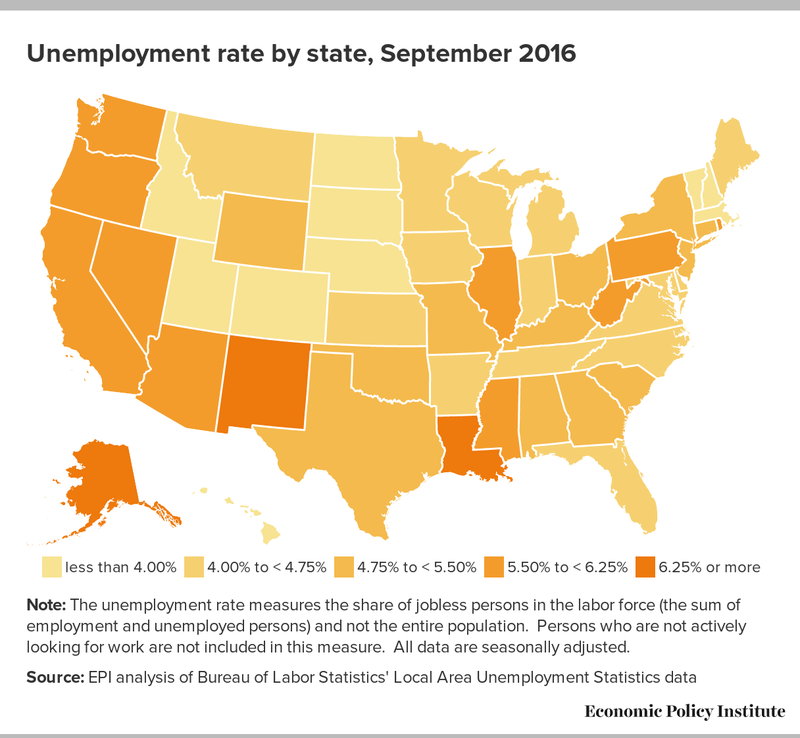 Unemployment rates have been relatively stable, although more significant changes, both positive and negative, can be seen in a handful of states. From June to September, 38 states and the District of Columbia added jobs, with the largest percentage job gains occurring in Florida (1.2 percent), Nevada (1.1 percent), and Tennessee (1.0 percent). Over the same period, 12 states lost jobs. New Mexico (-1.2 percent), Alaska (-0.9 percent), Louisiana (-0.6 percent), and Oklahoma (-0.6 percent) experienced the largest losses. These four states—along with Kansas, North Dakota, and Wyoming—had fewer jobs in September of this year than they did in September of 2015. Much of these losses can be traced to the continued decline in energy prices. The unemployment rate declined in 19 states from June to September. The largest declines occurred in Illinois (-0.7 percentage points), Alabama (-0.6 percentage points), Massachusetts (-0.6 percentage points), Nevada (-0.6 percentage points), and Utah (-0.6 percentage points). Unemployment rose in 28 states over the same period, although most of the increases were modest. Missouri (+0.7 percentage points), Oregon (+0.7 percentage points), and Kansas (+0.6 percentage points) had more sizeable increases in unemployment. Job growth in Oregon and Missouri over the past six months suggests that some of this increase could be the result of previously discouraged jobseekers restarting the job search. The same cannot be said for Kansas, where job numbers have fallen over the past year. The labor market weakness in energy-intensive states over the past year highlights the risk of relying heavily upon a limited number of industries for growth. Diversifying states’ industrial makeup requires investing in education, yet many states are still investing too little in their public education systems. For those state economies moving closer to relatively healthy conditions, policymakers should start working to combat longstanding inequities in labor market outcomes, such as the significant pay gaps that exist for women and people of color, the lack of retirement security for Hispanic families, and the persistently elevated unemployment rates faced by the African American community in much of the country.